Do you feel weighed down by stress? Do you have repetitive negative thoughts? Do you wake up exhausted each morning? If any of these sound like you, this Hypnotic experience will help you find a way to feel better about yourself, and life. I've helped hundreds of people to let go of their stress, anxiety and insomnia, why not you? 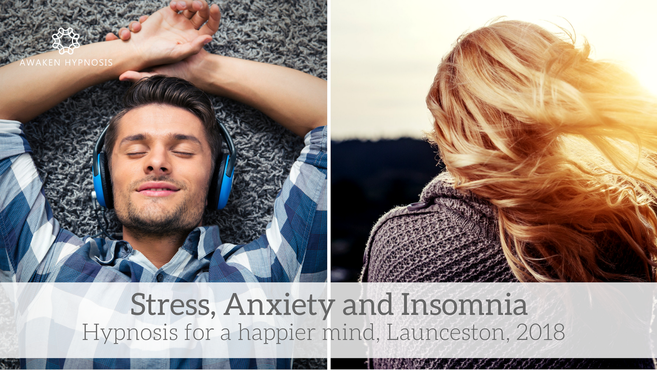 This Launceston workshop uses the best Hypnosis and NLP (Neuro Linguistic Programming) techniques to help you to banish stress, relieve anxiety and sleep more deeply at night. It also takes advantage of the amazing brainwave technology used in the Bliss Lounge, to ensure you can relax deeply and enjoy the experience, whether you are new to Hypnosis or a regular user of it. "I really enjoyed the workshop last Saturday. It was value for money, nice calm welcoming environment. The hypnosis sessions are well thought out by having the shorter one first to get everyone used to what's happening. My stress levels this week have been reduced and I am sleeping a lot better. I'm hoping it will continue 😀. Thank you for the good work you do. Launceston is lucky to have you. I am a fan. This class will teach you about stress, anxiety and insomnia and show you some ways to relieve these troubles. It will also include multiple hypnosis sessions to reprogram your mind to be calmer, happier and sleep more easily. It is suitable whether you suffer from just stress, just anxiety, just insomnia, or any combination of the three. I know some of you may have social anxiety, so I want to reassure you that you don't need to interact with the group, or speak in front of the group. It can feel like a private session for you. The experience is restricted to a maximum of 6 people, and you will have your own very comfortable reclining chair, and Kasina sound and light technology to ensure you relax deeply. Bookings: Click here to book! "I thought it was a great session. I felt as if I was there on my own, didn’t feel effected by there being others there, and to be honest you could easily think you were on your own. Very good value for money and felt very comfortable and relaxed. I have had the one on one with you and I must say, that I found this to be every bit as good as my one on one. Very happy with the morning and it was lovely to see you again. I guess everyone tells you this, but I will say it anyway... you have a lovely voice, very soothing, relaxing and smooth... perfect for your profession." "Thank you for yesterday - I am implementing some of the pre bed steps, have found the setting on my phone to dull the lights so see how that goes tonight. Last night I slept better only waking once & then I used the breathing in for 4 out for 5 and managed to go back to sleep fairly easily (even had a dream) So I am sure over time using your techniques and the session from yesterday things will improve." CANCELLATION POLICY - Prepaid events & workshops are non-refundable. You may transfer your ticket to someone else, as long as I'm alerted prior to the event. If enough notice is given of a cancellation and I am able to re-sell your seat to someone else, you may be eligible for a credit to another workshop. However there is no guarantee I will be able to re-sell your seat, even if a waiting list is in place.